Do you want to stand out from the 100's of others applying for positions with the Postal Service? If you do there is only one way to stand out and that is to further your education. In this day and age it is so critically important to have formal training and many people never know it. The Self Study programs at AceYourPostalExam.com will provide you value added skill sets that will bring your resume to the top of the pile and at the very least it will set you apart from the other job candidates who have only a high school education. Our online training programs have been designed to be interactive, entertaining and more importantly useful in everyday work life. This series presents strategies for handling interpersonal tension in the workplace. In each course, learners will gain insight into analyzing situations, determining the best courses of action, and resolving problems. Scenarios and examples include working with difficult people in any organizational situation - supervisors, peers, and subordinates. 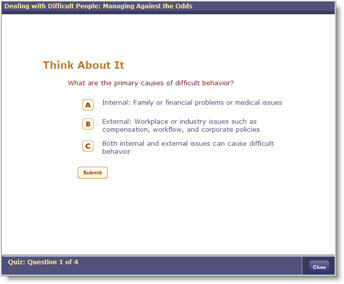 • Instructional audio allows learners to hear instructional audio tracks for each course page. • Flash scenarios use real world situations to illustrate course concepts. • Decision Point activities allow learners to work toward an outcome in an interactive environment. • Bookmarking tracks a learner's progress in a course. • Exercises allow learners to practice in the actual application being studied. • A glossary provides a reference for definitions of unfamiliar terms. • Courses challenge the learner with a variety of question formats, including multi-step simulations, true/false, multiple choice, and fill-in-the-blank. • A skill assessment generates a customized learning path based on the results of a pre-test. Upon purchasing this Dealing with Difficult People package, you will IMMEDIATELY receive access to this powerful online training program. BONUS: All AceYourPostalExam.com members who purchase a practice postal exam package will receive FREE access to the recently launched, Google operated online postal exam discussion board and forum. The forum was created as a means to offer members of AceYourPostalExam.com a chance to communicate and share postal exam tips or pose questions to other people throughout the country who are studying for their postal exam.